This course is for those who are new to OpenStack who want to learn the cloud networking fundamentals and get started with OpenStack networking. Basic understanding of Linux Operating System, Virtualization, and Networking, and Storage principles will come in handy. OpenStack is a collection of software projects that work together to provide a cloud fabric. Learning OpenStack Cloud Computing course is an exquisite guide that you will need to build cloud environments proficiently. This course will help you gain a clearer understanding of OpenStack&apos;s components and their interaction with each other to build a cloud environment. The first module, Learning OpenStack, starts with a brief look into the need for authentication and authorization, the different aspects of dashboards, cloud computing fabric controllers, along with 'Networking as a Service' and 'Software defined Networking'. Then, you will focus on installing, configuring, and troubleshooting different architectures such as Keystone, Horizon, Nova, Neutron, Cinder, Swift, and Glance. After getting familiar with the fundamentals and application of OpenStack, let's move deeper into the realm of OpenStack. 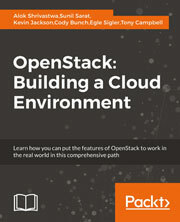 In the second module, OpenStack Cloud Computing Cookbook, preview how to build and operate OpenStack cloud computing, storage, networking, and automation. Dive into Neutron, the OpenStack Networking service, and get your hands dirty with configuring ML2, networks, routers, and distributed virtual routers. Further, you'll learn practical examples of Block Storage, LBaaS, and FBaaS. The final module, Troubleshooting OpenStack, will help you quickly diagnose, troubleshoot, and correct problems in your OpenStack. We will diagnose and remediate issues in Keystone, Glance, Neutron networking, Nova, Cinder block storage, Swift object storage, and issues caused by Heat orchestration. This course aims to create a smooth learning path that will teach you how to get started with setting up private and public clouds using a free and open source cloud computing platform—OpenStack. Through this comprehensive course, you'll learn OpenStack Cloud computing from scratch to finish and more!